Have 2 channel modis edge as well as 4 ch. pico. Can I use BNC to banana jack adapters with this for Modis Edge? 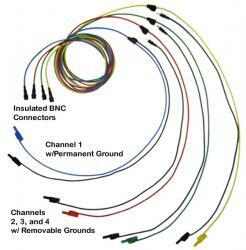 Just curious as to whether a BNC to banana jack adapter would allow two of the 4 channels cable sets to be used on a Modis Edge so I don't have to buy a separate set of test drive leads?